Inside the big yellow box, you’ll find everything you need to put the DeWalt DWS779 to work. 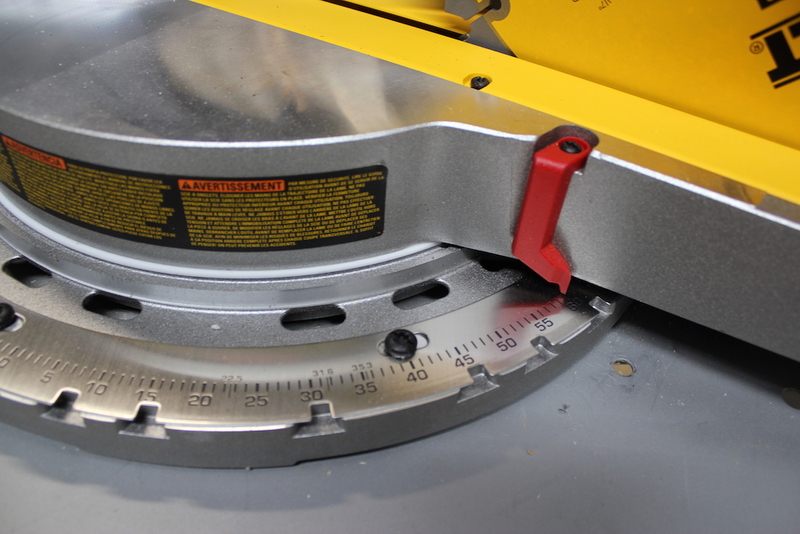 A 12”, carbide-tipped 32-tooth blade comes pre-installed on the saw. It’s a decent-quality blade, and it’s fine for general construction. Anyone doing finish work will want to swap it out pretty quickly for a good finish blade with 80 or more teeth, though. Options for blades are wide open, as the saw will accept blades with either a 5/8” or 1” arbor. The blade wrench you’ll need to make that swap also comes with the saw. Keeping it company are the very informative user’s manual, a DeWalt DW7053 dust bag, and a material clamp. The clamp is easy to install, and useful if the sight of small flying chunks of wood is disturbing to you. The blade wrench clips securely into a nook behind the fence. Right out of the box, the DeWalt DWS779 is ready to work. After liberating the DeWalt DWS779 from its packaging, I checked the fence and blade for square. Both were dead on, a good reflection on whoever is doing the final prep at the factory before shipping. The manual has good instructions on how to true up anything that can get out of whack, but it’s much nicer to be able to just get right to work. 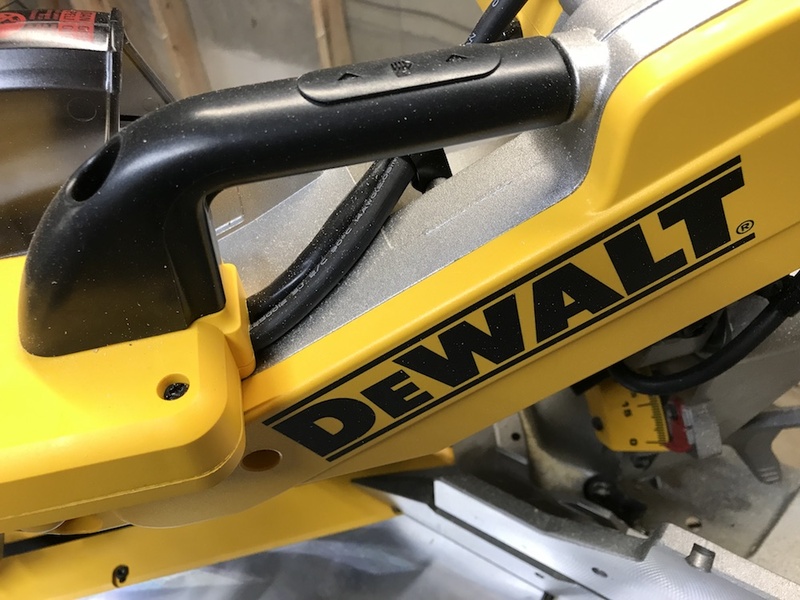 After many years of producing sliding compound miter saws, DeWalt knows what features are important to its customers. The most important features in what’s left of MY mind are accuracy, reliability and durability. Again, the saw was set up to make perfect cuts right out of the box, and it’s completely adjustable if it gets out of whack by getting knocked over or dropped (not that THAT ever happens). 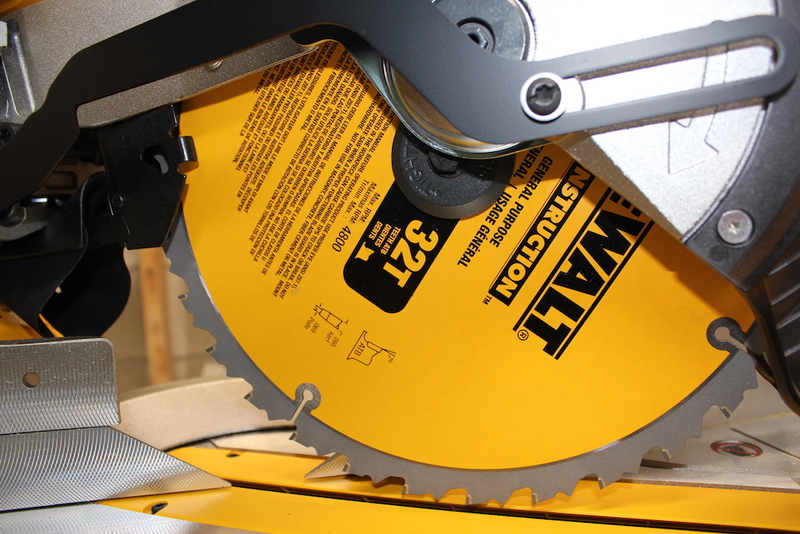 As for reliability and durability, the saw has been around for several years, and has a very good track record. From the git-go, the DeWalt DWS779 feels rock solid. 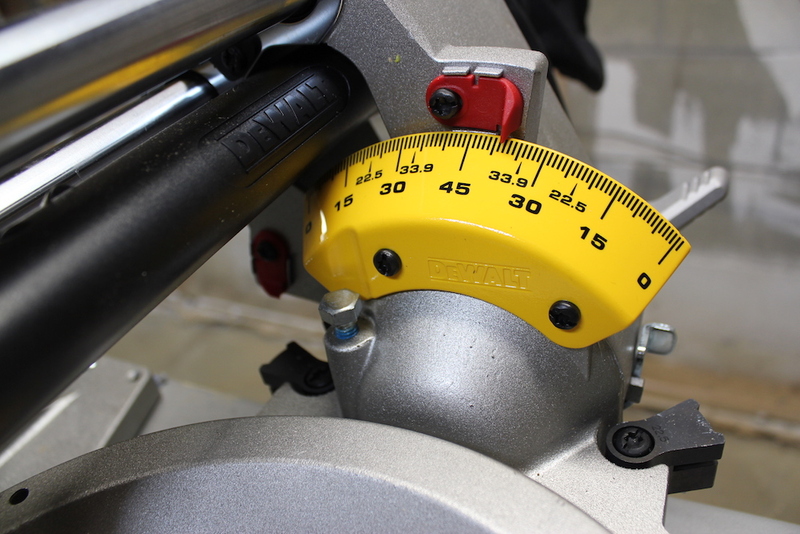 The miter angle is very fast and easy to adjust, from 50° left all the way to 60° right. An etched miter scale makes the angles very easy to read. Several detents allow you to quickly set the most common angles, and the saw locks them in with no slop. 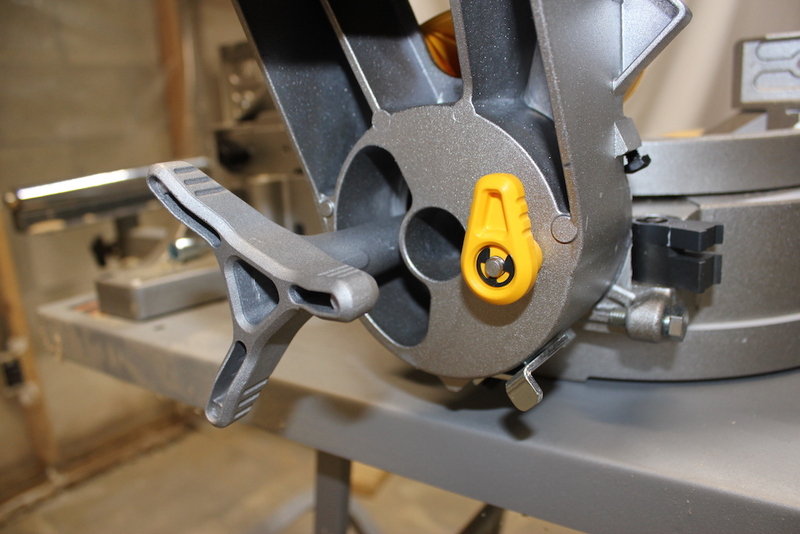 A miter latch override lets you override the detents, and pushing the miter lock handle down solidly locks the miter in at any angle. And there’s plenty of wiggle room, with up to 60° of separation. Push the handle down, and the angle locks solidly in. Setting the bevel angle is also straightforward. 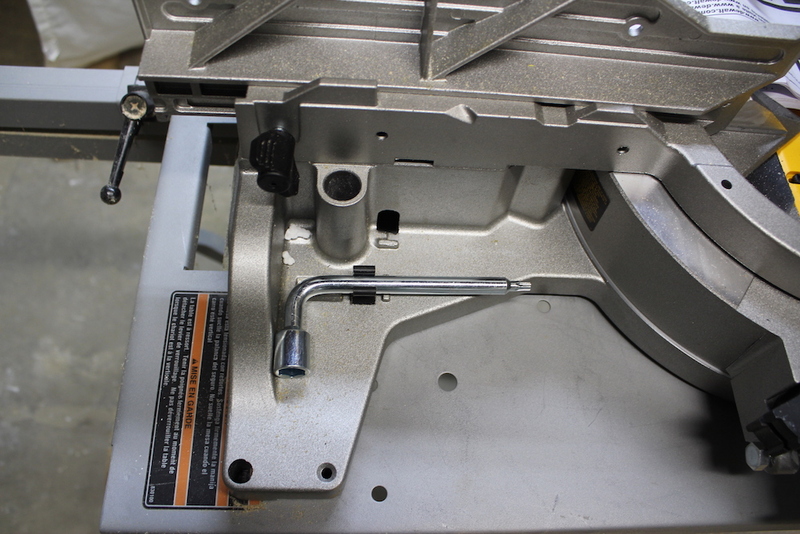 Turn the bevel lock knob to free up the head, and move the saw head to the left or right. (To bevel to the right, simply pull out the 0° bevel override knob). Then just tighten the bevel lock knob. 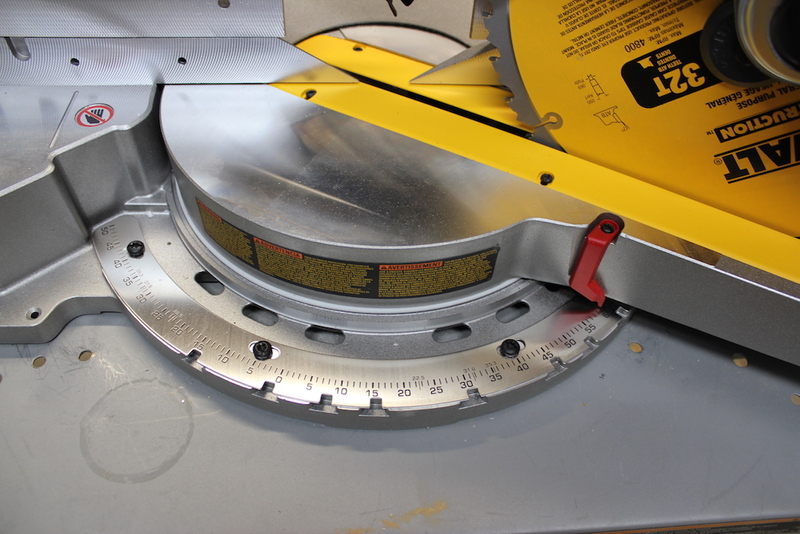 The black-on-yellow bevel scale is very easy to read, and is marked for the most common bevel cuts. And setting the bevel is fast with the locking knob and 0° bevel stop. The fence on the DeWalt DWS779 is tall, sturdy, and easy to adjust. Simply turn the adjusting knob on the rear of the fence, and slide it sideways. 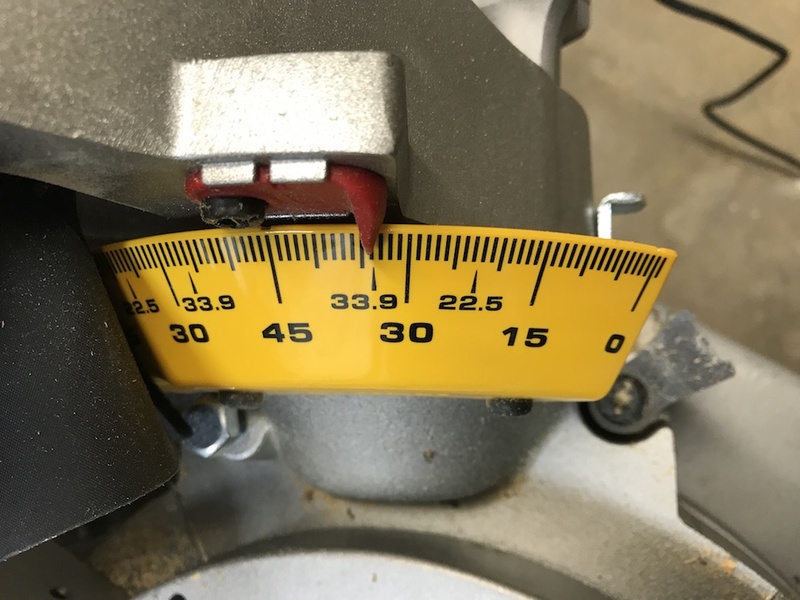 To avoid sparks, damage, injury and involuntary loss of bladder control when making radical cuts, with steep bevel and miter angles, you may have to remove the fence altogether. Just loosen the knob a bit more, and the fence will slide right off. Cut capacity on the DeWalt DWS779 is excellent, with the ability to cut dimensional lumber up to 2×14. If Excellent just isn’t good enough for you, DeWalt has a work-around that lets you push the boundaries. By removing the fence and making a platform 14.5” x 26” x 1.5” thick, you’ll be able to make cuts on stock up to 16.1” wide at 90°, or 11.7” at 45°. That’s a big honkin’ hunk of wood! The user’s manual has full instructions on how to perform this little trick. But wait – there’s more! 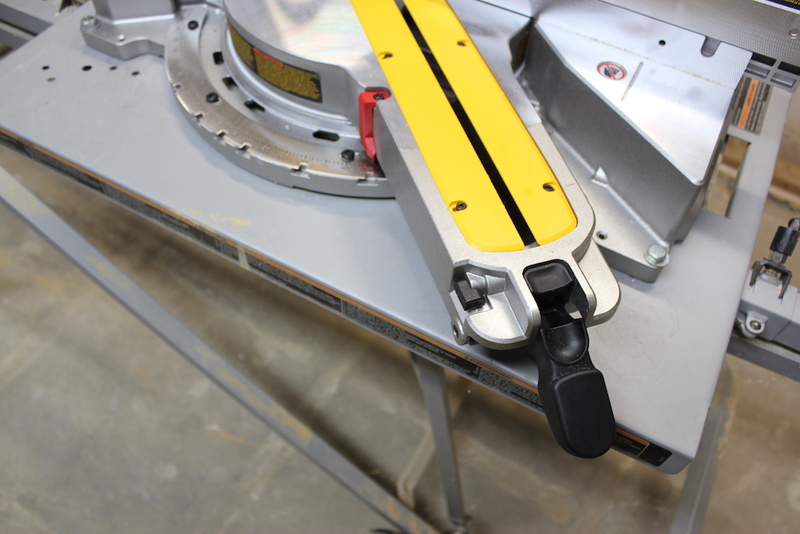 Using the adjustable depth stop, you can use the DeWalt DWS779 to cut dados or rabbets in your material. 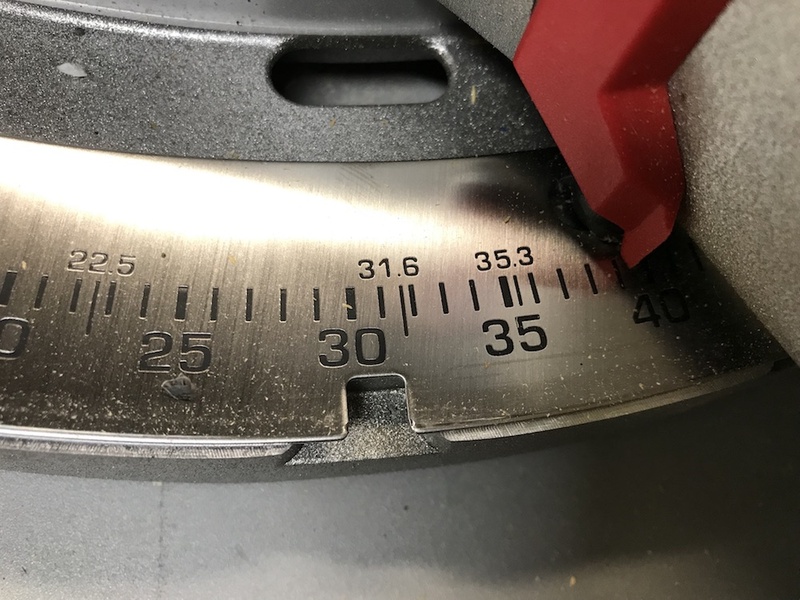 It won’t be as precise as a router, or a dado blade on a table saw, but if neither of those is available, and you take your time, it should do the job nicely. 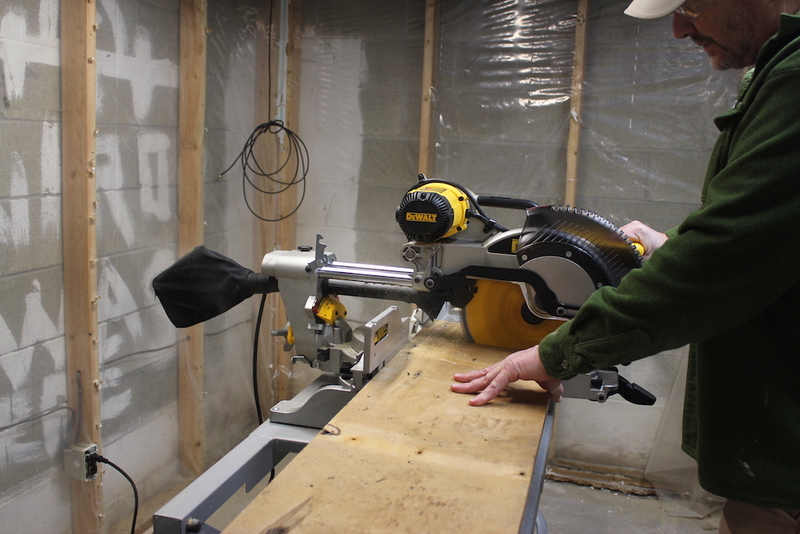 The testing ground for the DeWalt DWS779 was the basement of a current renovation project. At 56 pounds, the saw isn’t exactly featherweight, but it’s well balanced, and the handle on top made it fairly easy to schlep around. As I mentioned, the saw was good to go right out of the box, so I was able to get it right into action. The top carry handle makes the saw fairly easy to schlep. The base also has hand holds at each end. 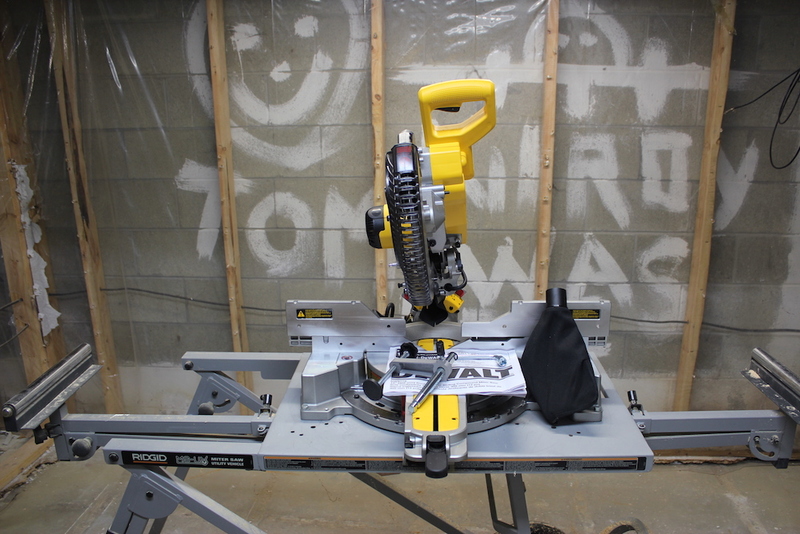 Before I started cutting, I bolted the DeWalt DWS779 onto an older Ridgid rolling miter saw stand. 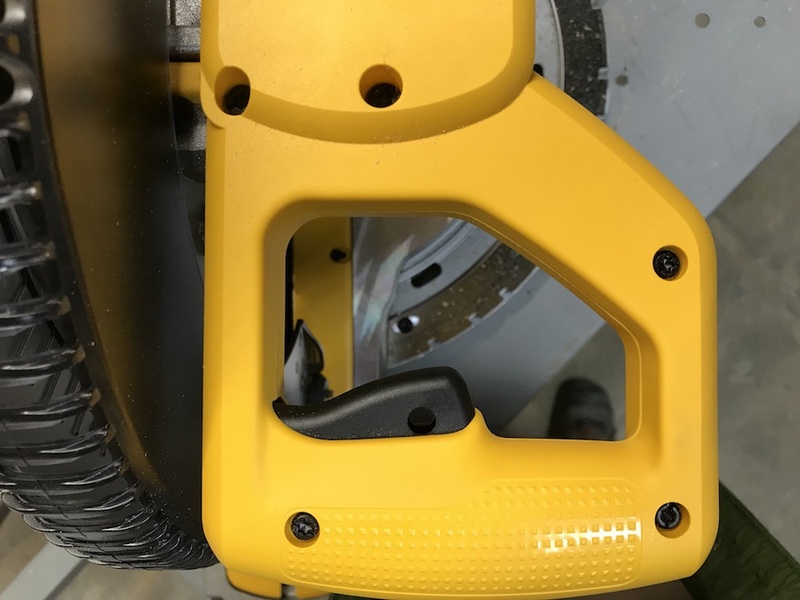 Two of the pre-drilled holes in the stand lined up perfectly with those on the saw, and it was easy to drill a couple more to get four points of attachment. Cutting dimensional lumber with the DeWalt DWS779 was a breeze. 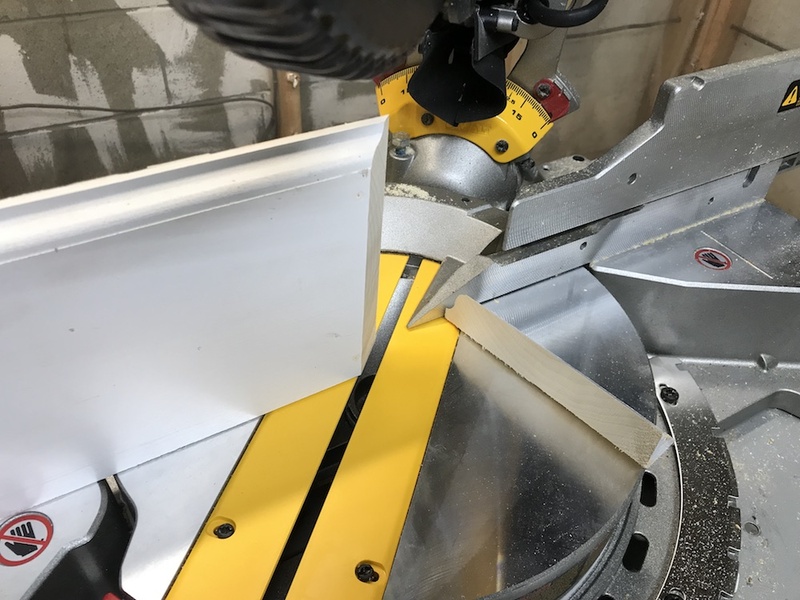 The 32-tooth blade sliced easily through 2x4s, 2x6s and 2x10s. It also made quick work of cutting down several 1x12s to make some utility shelving. The saw doesn’t have a “soft start” feature, so the blade jumps a little when the trigger is pulled. No biggie, and I got used to it pretty quickly. When the trigger is released, the built-in brake stops the blade within a few seconds. I also made several cuts in 5” wide ¾” tongue & groove oak flooring. The DeWalt DWS779 had plenty of power to quickly trim the flooring to length. Although not the best blade for the job, since the 32-tooth blade was new, it actually left us with pretty clean cuts. Almost a shame to hide them under the baseboards! Speaking of which, the saw easily made miter cuts in 1×6 baseboard held vertically against the fence, with room to spare. Although we weren’t installing any crown mold, I made a few test cuts on some 5” wide crown mold to check out the saw’s settings. 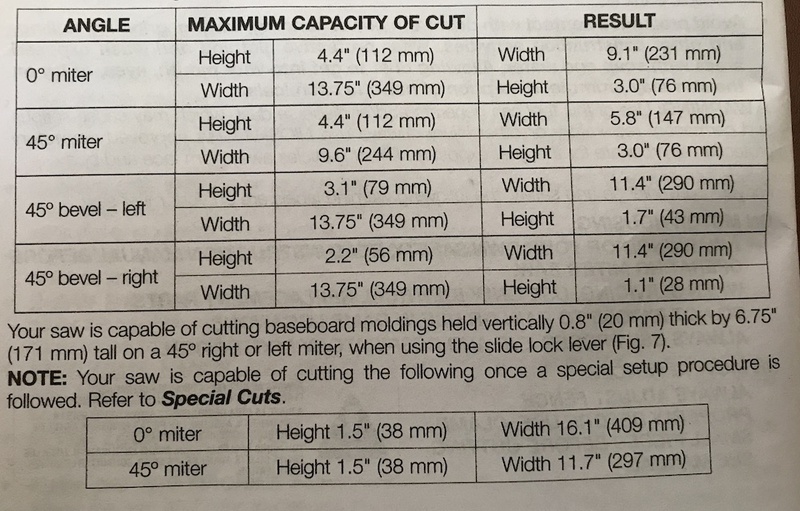 The user’s manual gives excellent instructions on how to set up the saw for various inside and outside corners, and special markings on the scale make it simple to set the saw to the exact angle needed for the most common cuts. Once again, the stock blade made fairly clean cuts, but only because the blade was new. And on the bevel gauge. And a nice, smooth cut. During all of our testing, the DeWalt DWS779 operated flawlessly. The saw slid fairly smoothly along the rails, and the dust bag managed to corral about half of the sawdust I generated. 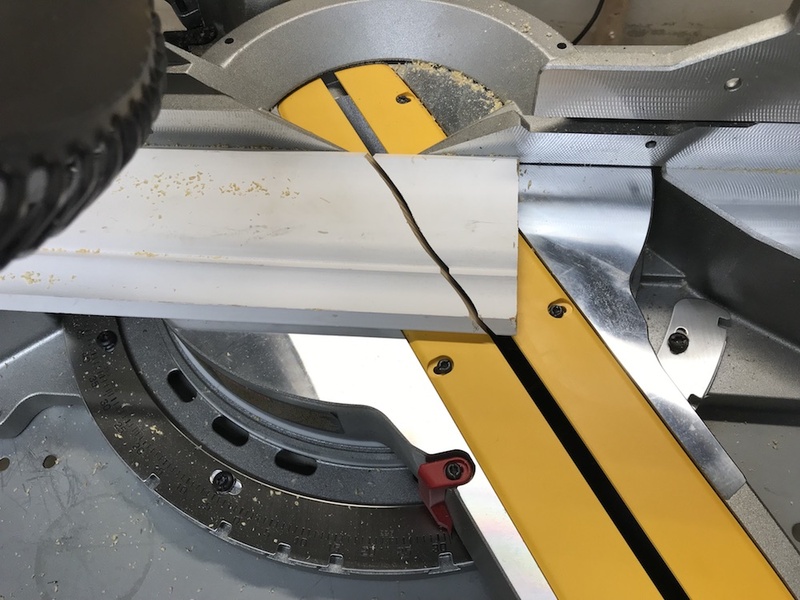 I’ve been using a battery-powered miter saw a lot lately, and while I understand the rationale behind having a trigger safety on a battery-powered saw, it was kinda nice not to have to fumble for it while using the big DeWalt slider. The trigger is smooth, and easy to operate. If you’re right-handed. Angling For A New Saw? The DeWalt DWS779 has been around long enough to become a mainstay on many job sites, and in many a home workshop. 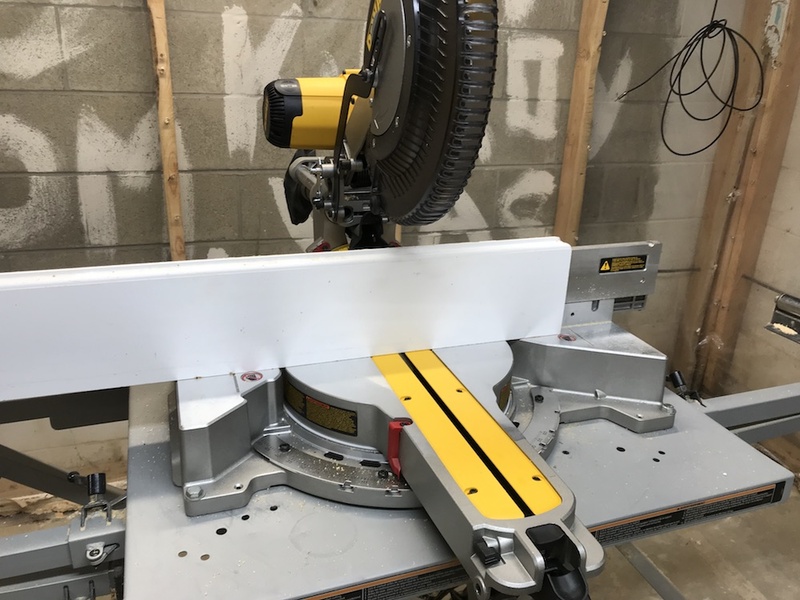 It has a slew of features that make it useful for both trim and framing carpenters, and its rugged build makes it likely it will be around to make the cut for many years. With a recent price reduction to $350, it’s a lot of beveled bang for the buck. For framing or trim, the DeWalt DWS779 is ready to right-size your lumber. DeWalt backs the DeWalt DWS779 with a three year limited warranty, and a one year Free Service Contract. 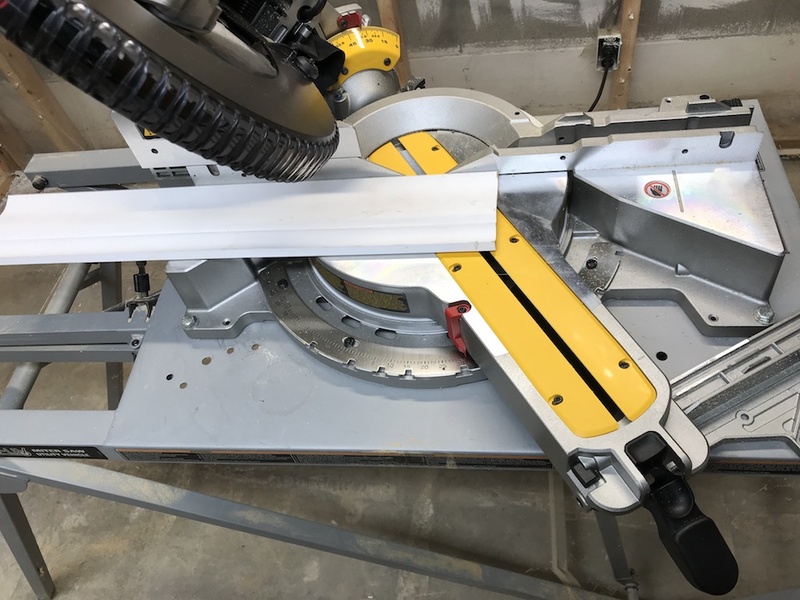 To give you a risk-free opportunity to chop, miter and bevel from every angle, the saw is also covered by a 90 day Money Back Guarantee.